In 2006 Fr Anastasius Reiser of Münsterschwarzark embarked on a long journey in order to become abbot of Peramiho Abbey in Tanzania. The confrères there knew him from a former mission commitment, and so once again a German became superior in an African abbey – and not only in anyone: Peramiho is the primordial monastery of our Congregation in East Africa. A whole church province with six dioceses emerged out of this abbey, and numerous monasteries in Tanzania, Kenya, Uganda and Zambia descend directly or indirectly from there. Abbot Anastasius gave up his office in 2017 knowing that time has come for an African superior. From June 1 to 3, 2017 the monks of the monastery gathered and elected a successor. 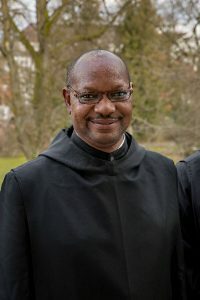 They have scarcely monks with leading experience in their own ranks, and so the community agreed to choose a monk from the neighboring monastery of Ndanda, Fr Sylvanus Kessy (51). He was for many years prior under two abbots and priest of the big parish of the abbey as well: a man with experience and discretion. He accepted the huge task in Peramiho only after some hesitation – proof for his careful prudence. Now he will lead Peramiho for three years as “Prior Administrator”. Then it will mean for the monks again to line up for election. There was an election in the abbey of Mvimwa, entirely in the west of Tanzania, in the beginning of June as well. Abbot Denis, the predecessor, has resigned out of personal reasons only after three years. The community has strongly grown in the last years and consists of over 80 monks, out of which 45 were allowed to elect. They gathered on Tuesday after Pentecost and started with the election under the guidance of Abbot President Jeremias. 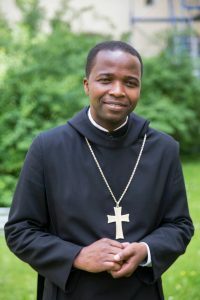 On Wednesday, Fr Pambo Mkorwe reached the required majority. He was elected “in absentia” because as Congregation Secretary he lived in St Ottilien. There he helped in the leadership of the Missionary Benedictines. He had to give up this task he adopted in October 2016 and embark on his journey back to Tanzania. On August 26, 2017, the local bishop gave him the abbatial blessing.